This was an off-the-cuff recipe thrown together with leftover ingredients on a weeknight - Spanish chorizo, pickled padron peppers, yellow bell pepper, and leftover roasted potatoes. 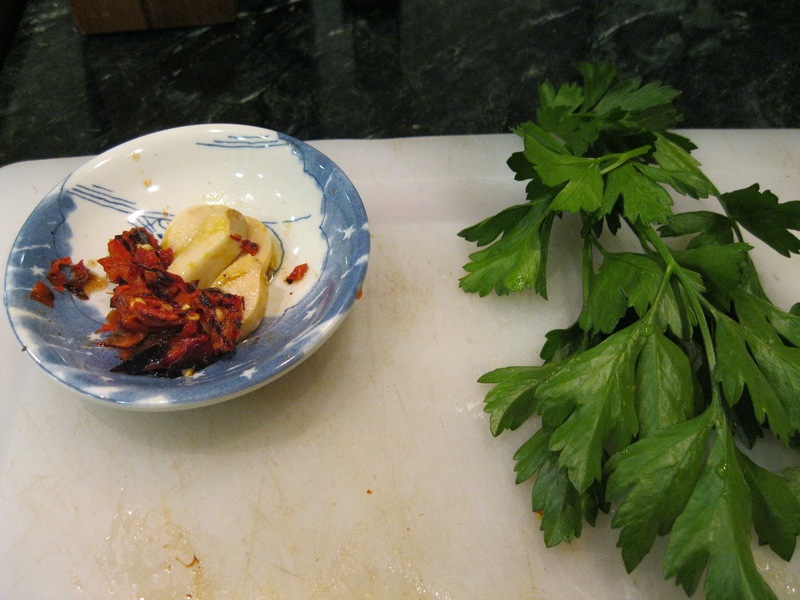 It follows a Spanish theme so I used fresh parsley, garlic, and sweet pimentón as herbs and spices. 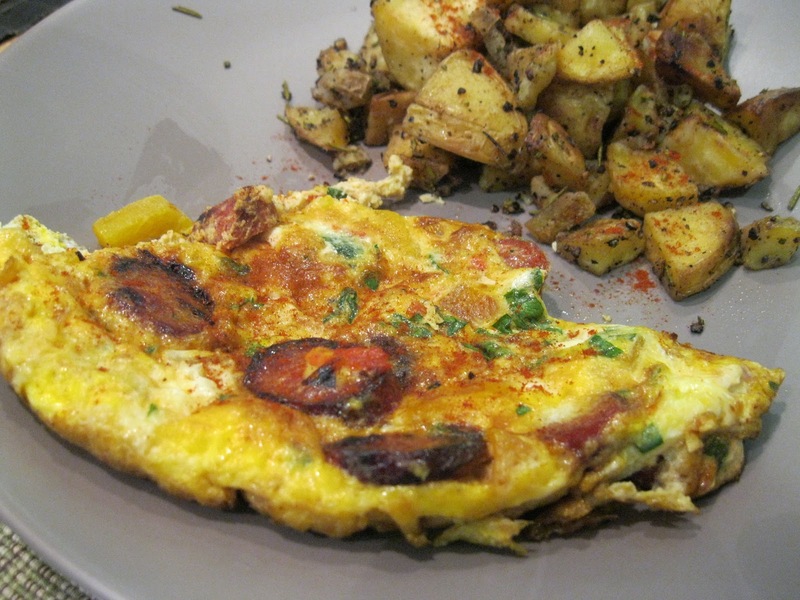 A nice omelet for a quick tasty meal. 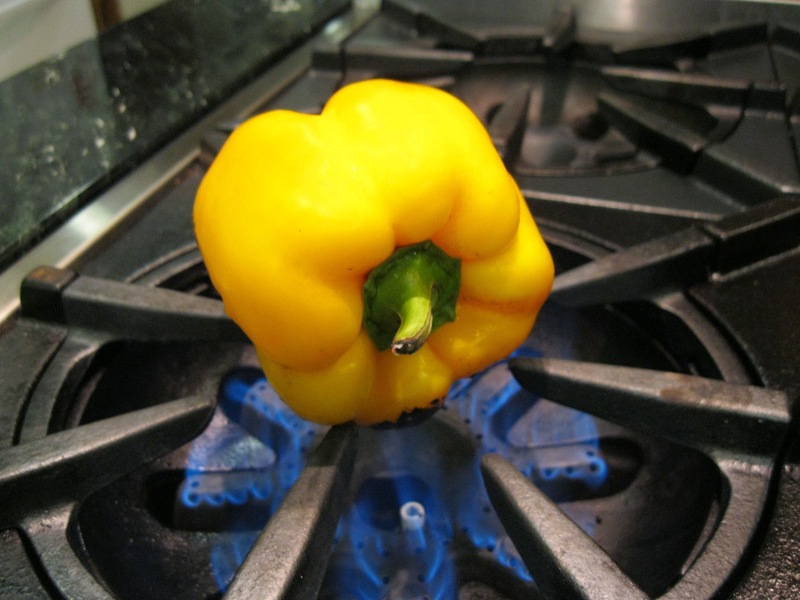 Char the pepper by putting it over a open gas flame. Turn as each side blackens. 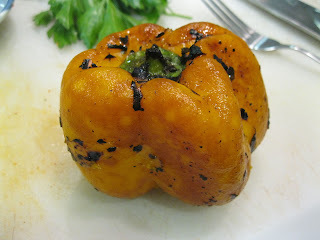 If you've never used this technique for cooking a pepper, the idea is to singe the entire outer skin of the pepper directly over a flame; even though it may seem burnt it is just a prep to make the skin easy to peel while imparting a bit of a smoky flavor to the flesh of pepper. This also works great on the flame of a grill. Meanwhile heat a skillet over a medium flame, add the oil to heat, then add the chorizo disks. Cook the chorizo to a good color then remove with a slotted spoon to set aside. 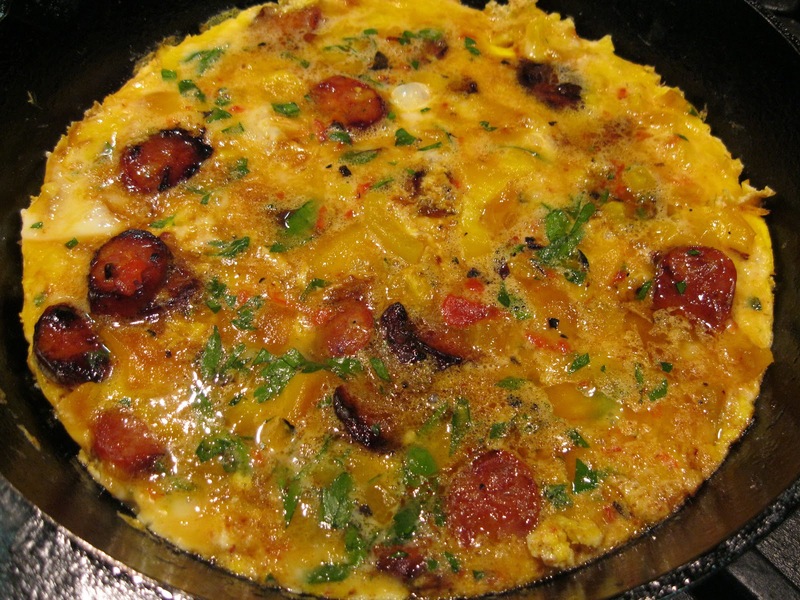 Remove the pan from the heat saving 2 tablespoons of oil in it for the omelet. When the pepper is done, put it into a paper bag, close the bag tightly and allow the pepper to cool for about 10-15 minutes. When you take the pepper out of the bag, rub the peel off as well as you can; it should come off completely. Slice the pepper into strips then mince. Break the eggs into a bowl and stir well with a fork to combine thoroughly. 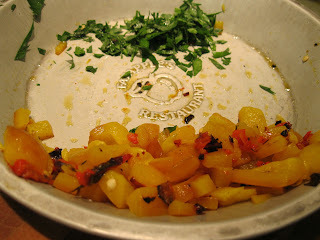 Add the padron pepper, bell pepper, parsley, chorizo, salt and a sprinkling of pimentón. Heat the skillet with the oil again over medium-high heat and pour the egg mixture in. Allow to cook for a minute then reduce the heat to medium low. Drag a wooden spoon along the side of cooking egg mixture to prevent it from sticking to the sides then allow to cook until the top is just a little loose. Meanwhile prepare a broiler to high heat. Once the egg looks done, put it in the hot broiler to cook for a minute or two on the top, you just want to brown it a bit. 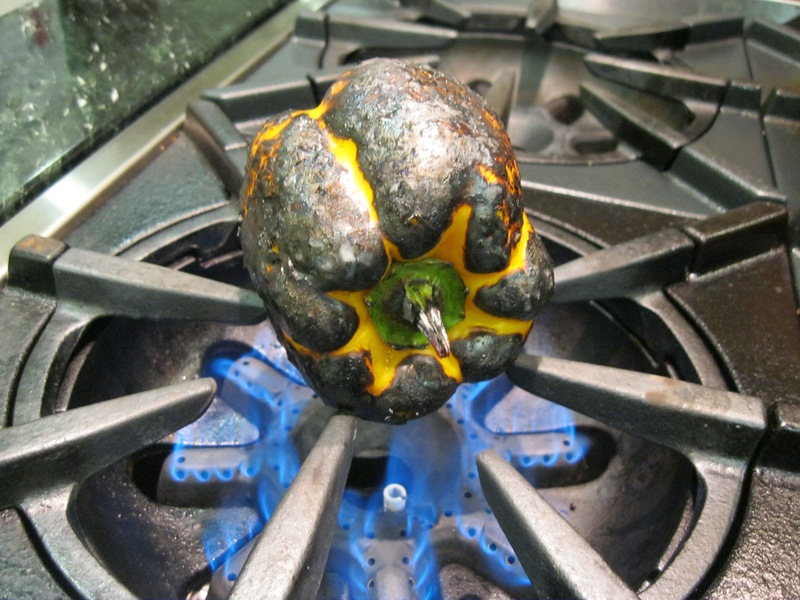 Remove from the broiler and cut it into quarters to serve.